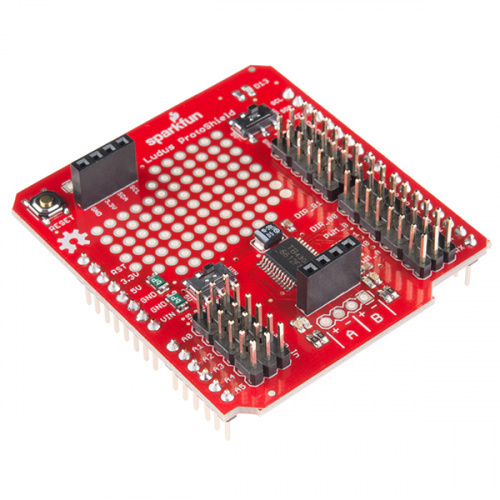 The Ludus Protoshield is an Arduino shield designed to make it easier and faster to connect motors and sensors to your Arduino compatible development board. It's really handy for throwing together remote control rovers and small autonomous robots. This guide will get you up and running with your very own Ludus ProtoShield or Ludus Protoshield Wireless! Aside from the Ludus Protoshield, you will also need to stack the shield to a microcontroller. 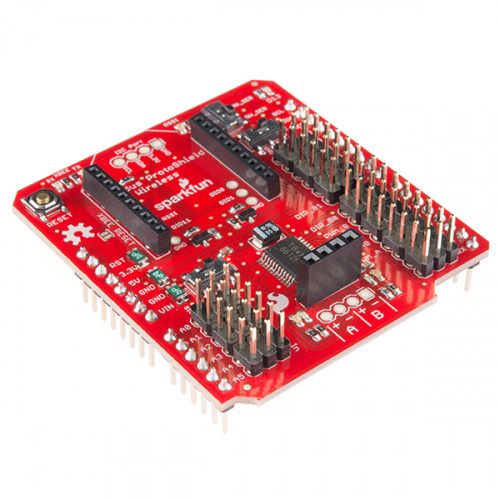 We recommend the SparkFun RedBoard or any other Arduino form factor boards such as the Arduino Uno or the Arduino Leonardo. One of the main features of the Ludus Shield is to make working with motors easier for those just learning. In order to fully utilize this shield, you'll also need some motors to drive. Check out our Motors Category for some ideas. You may find some of the following concepts useful before using your Ludus ProtoShield. 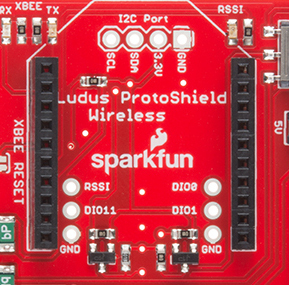 There are two versions of the Ludus Shield available: SparkFun Ludus ProtoShield and Ludus ProtoShield Wireless! First, let's have a look at the hardware that they have in common. The heart of both versions of the Ludus ProtoShield is an H-Bridge Motor Driver. This allows the ProtoShield to drive two DC motors at once in both directions and even brake electronically. This H-Bridge Driver in particular, the TB6612FNG, is rated up to 1.2A per channel at 13V which means it will drive a fairly beefy hobby motor. This makes it ideal for small rover-style robots and kinetic sculptures. Watch out! Although the TB6612FNG is rated for 1.2A per channel, we found in testing that the practical limit is about 0.8A on both channels before the driver goes into thermal shutdown. You may be able to remedy this with heatsinks and/or active cooling, but we recommend a continued load below 0.8A for most users. Another feature that both versions have in common is the addition of power (PWR) and ground (GND) rails alongside the GPIO pins. Not only does this help you to avoid the common inconvenience of running out of GND and PWR pins, but because the pins are arranged with PWR in the center, plugging in servos is a snap! The PWR rail can even be switched between 5V (from the Arduino's voltage regulator) and Vin using the on board slide switches. The difference between the two boards is that the standard Ludus ProtoShield includes an I2C header whereas the Ludus ProtoShield Wireless adds to that an XBee socket. The I2C header on the standard Ludus ProtoShield is laid out so that you can plug in a device such as a Triple Axis Magnetometer or even the 9DOF Sensor Stick. With these sensors it's possible to set up a dead reckoning navigation system. If autonomy isn't your thing, though, the Ludus ProtoShield Wireless is perfect for setting up XBee based remote control. Simply plug an XBee radio module into the socket on the shield, and you're ready to transmit wireless data using the common zigbee standard! We can look at the silkscreen on the shield itself to find out which Arduino pins are connected to which inputs on the H-Bridge. Once we know that, we can start to write some basic example code to control the driver. Before anything is going to move, we'll need to connect a pair of motors. If you're just starting out with robotics, we suggest the DAGU Hobby Gearmotors which are the same ones that come with our Ardumoto Shield Kit. Solder a pair of jumper wires to each of the gearmotors, and plug them into the A+, A-, B+ and B- headers. The example code also allows you to control a servo, so if you'd like to add a servo, plug it into pin 11. Now, attach the shield to an Arduino or SparkFun RedBoard and connect a power supply, such as a 9V battery. Once that's done, we can get the example code loaded onto the Arduino. Grab the example code from the GitHub repository here, and open it in Arduino. Connect your RedBoard or Arduino over USB, and make sure you have the correct board type and COM port selected. Now press "upload" to send the example code to the board! If everything went well, you should now be able to open a serial terminal (such as the one built into the Arduino IDE), and type a bunch of "w"s to make the motors turn. This example was really written to be used with terminal programs, which allow you to type directly to the port without having to press return. That way, you can drive the robot by holding down the appropriate keys on your keyboard. My favorite terminal program for this is RealTerm. You can get RealTerm here. Now that we've seen this thing in action, let's dig through the example code. Understanding how the example code works is the first step towards writing your own! 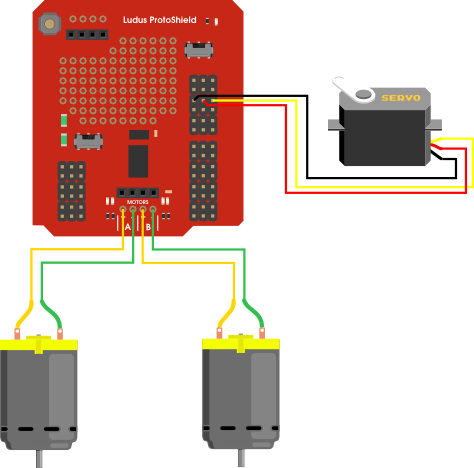 The example code for the Ludus ProtoShield is available from the Ludus Shield GitHub repository and is designed to let you control the H-Bridge, as well as a servo attached to pin 11, using serial communication. As you can see, we started out by including the servo library and creating a servo object called "swivel". Next, we declare a handful of variables to keep track of which pins are responsible for which functions, and also variables for the servo position and incoming serial characters. The setup() function is where serial communication is initialized, the servo object is attached and the control pins are all set as output devices. Finally, we call the function draw(), which we'll look at in a minute. This one is pretty straightforward! The draw() procedure is just a bunch of print statements that tell you which keys are attached to which functions. The brake() and shutoff() functions are structured the same as the motion procedures except that in the case of brake(), all of the pins are written high, and in the case of shutoff(), all of the pins are written low. The brake() procedure actually shorts the motor so that it resists turning. The shutoff() function simply shuts off power to the motors so that they come to a rolling stop. The only kind of clever thing going on here is that we check ahead of time whether we've reached the limits of the servo so we can't increment beyond its range of motion. If you have the Ludus ProtoShield Wireless, you can free your project from its USB tether! Do do this, you'll need a pair of XBee radio modules and an XBee Explorer USB. Even if you're not familiar with XBee, you should be able to run the example code wirelessly as the radio modules should be configured properly by default. 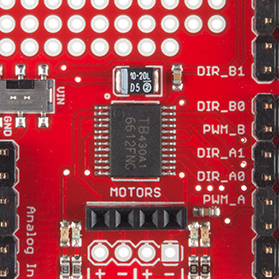 For an introduction to XBee, check out this SparkFun tutorial for getting started with XBees. There's a lot more you can do with XBee than what we'll cover here. The first step is to plug an XBee radio into the ProtoShield. The silkscreen on the board shows which orientation it should go. Make sure that the slide switch marked "HW_Ser" and "SW_Ser" is set to "HW_Ser". This will connect the XBee radio to the hardware serial lines of the Arduino. Next, plug your XBee Explorer into the USB port on your computer, and open the serial terminal program that you were using in the Simple Motor Control section. Open the COM port for the XBee Explorer and switch the Arduino on. The example code should now work exactly as it did before, only this time, your serial commands are being sent over the air! What's happening is that the XBee radio is acting like a wireless serial tunnel. As far as the Arduino knows, there's a USB cable hooked up to the serial line. Check out some of our other robotics tutorials to take your Ludus ProtoShield bot to the next level.